This page refers to Britain's national and traditional sports, as well as to those that are most popular today. England's national sport is cricket, although to many people football (soccer) is seen as its national sport. Football is England's most popular sport. Cricket is a bat-and-ball game played between two teams of 11 players on a field, at the centre of which is a rectangular 22-yard long pitch. One team bats, trying to score as many runs as possible while the other team bowls and fields, trying to dismiss the batsmen and thus limit the runs scored by the batting team. A run is scored by the striking batsman hitting the ball with his bat, running to the opposite end of the pitch and touching the crease there without being dismissed. The teams switch between batting and fielding at the end of an innings. Cricket is played on village greens and in towns/cities on Sundays from April to August. Football is undoubtedly the most popular sport in England, and has been played for hundreds of years. In the English Football League there are 92 professional clubs. These are semi-professional, so most players have other full-time jobs. Hundreds of thousands of people also play football in parks and playgrounds just for fun. The highlight of the English football year is the FA (Football Association) Cup Final each May. Tennis is a sport usually played between two players (singles) or between two teams of two players each (doubles). Each player uses a racket that is strung to strike a hollow rubber ball covered with felt over a net into the opponent's court. Tennis is an Olympic sport and is played at all levels of society at all ages. The sport can be played by anyone who can hold a racket, including people in wheelchairs. The modern game of tennis originated in Birmingham, England in the late 19th century as "lawn tennis" which has close connections to various field/lawn games as well as to the ancient game of real tennis. After its creation, lawn tennis spread throughout the upper-class English-speaking population before spreading around the world. The most popular English tournament is Wimbledon. For more information see here. Scotland is traditionally regarded as the home of golf. Golf in Scotland was first recorded in the 15th century, and the modern game of golf was first developed and established in the country. There are over 400 golf courses in Scotland alone. The most important golf club in Scotland is in the seaside town of St. Andrews, near Dundee. Although golf is often seen as an elitist sport elsewhere in the world, in the land of its birth it enjoys widespread appeal throughout the spectrum of society, in line with the country's egalitarian tradition. For example, the Old Course at St Andrew's and Musselburgh Links are public courses. Rugby football developed from a version of football played at Rugby School in Warwickshire and was originally one of several versions of football played at English public schools during the 19th century. The game of football that was played at Rugby School between 1750 and 1859 permitted handling of the ball, but players were not allowed to run with it in their hands towards the opposition's goal. The innovation of running with the ball was introduced between 1859 and 1865. The popular myth of the sport's origin states that Rugby pupil William Webb Ellis broke the local rules by running forward with the ball in his hands in 1823. For many years Rugby was only played by the rich upper classes, but now it is popular all over the country. There are two different types of rugby - Rugby League, played mainly in the north of England, and Rugby Union, played in the rest of England, Scotland, Wales and Ireland. England, Scotland, Wales and Ireland, together with France and Italy, play in an annual tournament called the Six Nations. American Football derived from the game of Rugby. Netball is a ball sport played between two teams of seven players. Its development, derived from early versions of basketball, began in England in the 1890s. By 1960, international playing rules had been standardised for the game, and the International Federation of Netball and Women's Basketball was formed. Games are played on a rectangular court with raised goal rings at each end. Each team attempts to score goals by passing a ball down the court and shooting it through its goal ring. Players are assigned specific positions, which define their roles within the team and restrict their movement to certain areas of the court. During general play, a player with the ball can hold onto it for only three seconds before shooting for a goal or passing to another player. The winning team is the one that scores the most goals. Netball games are 60 minutes long. Netball is the largest female team sport in England. The sport is played almost exclusively by women and girls, although male participation has increased in recent years. Horse racing, the sport of Kings is a very popular sport with meetings being held every day throughout the year. The Derby originated in Britain, as did The Grand National which is the hardest horse race in the world. Horse racing is a popular spectator sport. People can place bets on the races at legal off-track betting shops. Some of the best-known horse races are held at Ascot, Newmarket, Goodwood and Epsom. Ascot, a small town in the south of England, becomes the centre of horse-racing world for one week in June. It's called Royal Ascot because the Queen always goes to Ascot. She has a lot of racehorses and likes to watch racing. But the real spectacle of Royal Ascot is the fashion parade of Ladies' Day. Hats are de riguer and they range from the bizarre to the beautiful. But usually, the more outrageous the better. Polo is another equestrian sport. It is the fastest ball sport in the world, it is played with four men on horses to a team. A ball is hit with a stick towards the goal, one at each end of a 300 yard long by 160 yard wide field. A game consists of 4 to 6 periods called chukkas, a chukka is 7 minutes long. Teams change ends each time a goal is scored. It can be played by men and women of any standard. The handicap system goes from -2 at the bottom to the very best at 10. In handicap tournaments the number of goals start is obtained by multiplying the difference between the two teams' total handicaps by the number of chukkas to be played and then dividing by 6. There are usually two umpires on ponies on the field, and a third man, the referee, on the side line. Arena Polo is played during the winter, three aside and in an arena 300 feet by 150 feet. Darts is a form of throwing game in which darts are thrown at a circular target (dartboard) fixed to a wall. Though various boards and rules have been used in the past, the term "darts" usually now refers to a standardised game involving a specific board design and set of rules. As well as being a professional competitive sport, darts is a traditional pub game, commonly played in the United Kingdom. It is a very popular pub game. 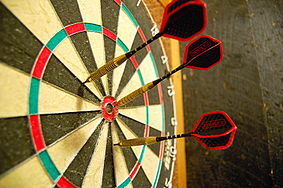 The game of darts, as it is today, was invented in the north of England in a town called Grimsby. However, the origins of the game date back to at least the Middle Ages. Angling is one of the most popular sports in the UK, with an estimated 3.3 million people participating in the sport on a regular basis. Fishermen can be see sitting beside anals, rivers and lakes. Angling is a method of fishing by means of an "angle" (fish hook). The hook is usually attached to a fishing line and the line is often attached to a fishing rod. Fishing rods are usually fitted with a fishing reel that functions as a mechanism for storing, retrieving and paying out the line. The hook itself can be dressed with lures or bait. A bite indicator such as a float is sometimes used. Angling is a principal method of sport fishing. Traditionally Boxing Day is a day for fox hunting. The huntsmen and huntswomen ride horses. They use dogs too. The dogs (fox hounds) follow the smell of the fox. Then the huntsmen and huntswomen follow the hounds. Before a Boxing Day hunt, the huntsmen and huntswomen drink hot wine. But the tradition of the December 26th is changing. Until 2004, Boxing Day hunts were a traditional part of Boxing Day but the ban on fox hunting has put an end to the hunt in its traditional sense. Hunters will still gather dressed resplendently in red hunting coats to the sound of the hunting horn but it is now forbidden in law to chase the fox with dogs, so the dogs now follow artificially laid trails.